That opening photo just drew me in. Coveting the measuring spoons. Have been eyeing them but haven't taken the plunge. Both sauces sing of autumn. Such fun to dress up something ordinary with something extraordinary. Love the scarecrows. They wouldn't scare the bunnies and squirrels though - they make "hay" in my garden! They were both pretty darn good warmer-uppers! The sauces look delicious and I'm bookmarking them for next year. I've already harvested and prepared for the winter. It turned quite chilly very quickly here. Love the scarecrows!! Chilly here now, too . . . what happened to Indian summer? I'll be putting porch furniture away in snow! I love condiments of all kinds...and this ketchup and mustard look lovely. Perfect for a burger! Thank you for sharing. What a great post to read before a long weekend (with plans of baking and cooking). I hope you have a wonderful Friday! A baking and cooking weekend sounds great this time of year. . . I'll be joining you! Hi Rosemary, first I have to say, I have to give you some credit for my ice cream. I have been craving home made ice cream since reading your pistachio ice cream post. Now I am craving bacon jam. I love your autumnal photos. I think your pirate scarecrow could do double duty over Hallowe'en before you retire him for the season. Also, I'm intrigued by the ShaSha sauce. This is a MUST TRY! Well, I'll be trying that lemon basil ice cream, for sure. 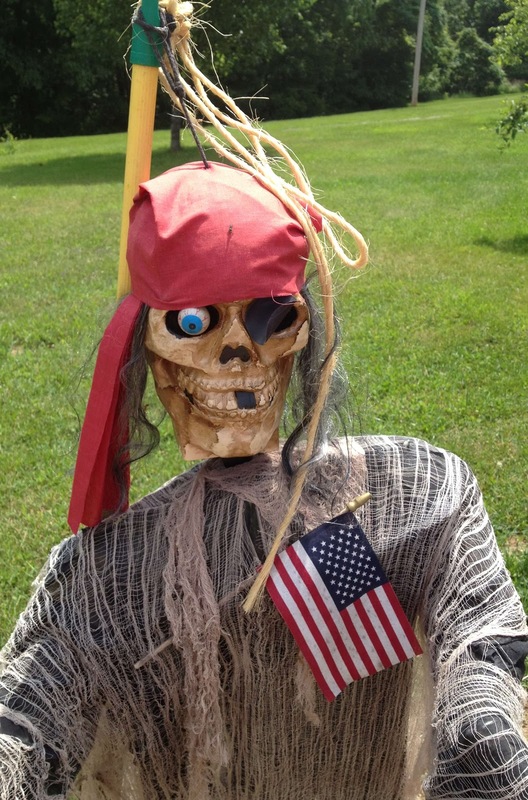 I have another great picture of the pirate-crow holding a beer can in his hook. I mildly refrained. Love that ShaSha sauce! Those scarecrows are hysterical! :o) Enjoy the weekend Rosemary! I never tried Shasha sauce before. Almost as addicting as sriacha! I am loving these "high brow" condiments. Bacon in a tomato jam sounds superb and the ShaSha sauce would be so good! It was the scarecrows you liked, wasn't it, Claudia! My neighbor is quite a creative fellow. These both sound like wonderful and unique condiments. I love tomato jam and with the addition of bacon it takes it to a whole new level. The tomato jam was my favorite. But the mustard is pretty jazzy, too. I liked them both just spread on bread! Very yummy Rosemary! I can think of a zillion ways to use these sauces! Better than good ol' ketchup and mustard. Oooh, that tomato bacon jam looks amazing! I bet it's wonderful on everything from burgers to poached fish to grilled cheese. 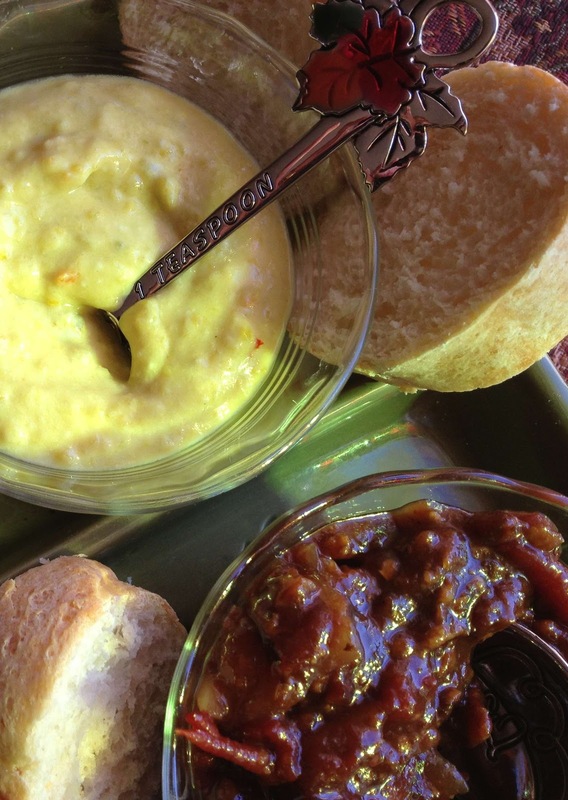 We tried the tomato jam topping scrambled eggs for a hurry up dinner -- great! I really liked to shasha sauce; I just may need to tweak the tomato jam . 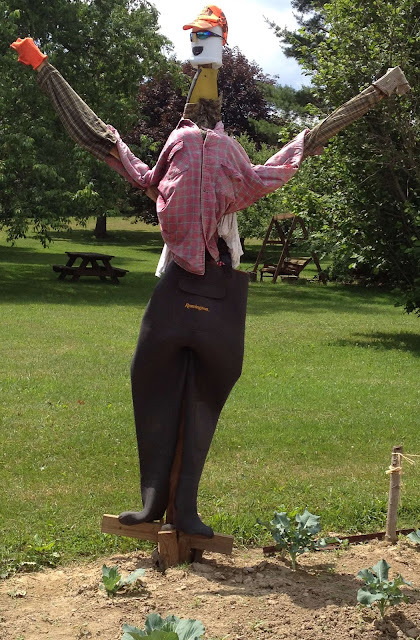 . .
LOVE the scarecrows! So cute. 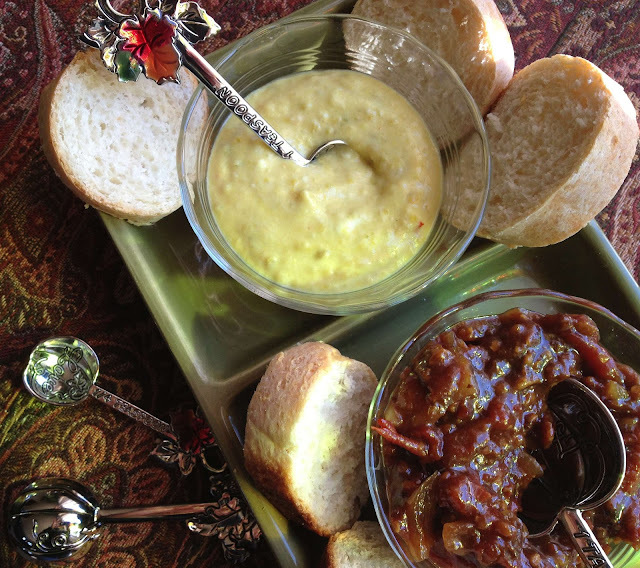 I cut this Bacon jam recipe out whenever it was published and thought I would make it again last summer but did not. It looks yummy! Thanks, Si. (You know, I liked your blog design so much, I got your designer to help me out!